There's 3 'C's' in my life - chocolate, chillies and cheese. Today it's all about the cheese, Cheddar cheese. Now if you thought all Cheddar was equal, think again. 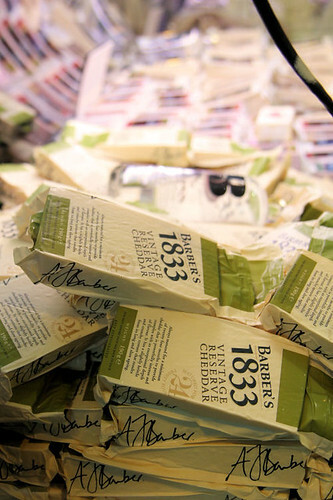 There's cheddar and then there's Barber's 1833 Vintage Reserve Cheddar! Barber's 1833 is an intense strong Cheddar, with a wonderful slightly crumbly texture that only comes from a minimum of 24 months of maturing. And yes, if you were wondering, the Barber family have been farming the land and making cheese for six generations, since 1833 to be precise! 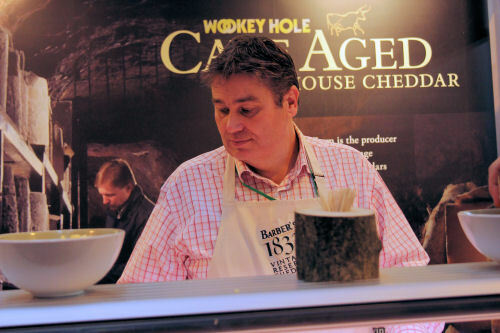 At their Maryland Farm in Ditcheat, Somerset, traditional methods combined with modern technology (in strict accordance with the Protected Designation of Origin for West Country Farmhouse Cheddar) means that the cheese has a unique character and is at the peak of perfection for the consumer. The latest generation of the Barber family are very active on the farm, managing their own land and dairy herds, and are a significant part of the local economy. I met with charming cousins Charlie and Giles Barber at the Good Food Show in Birmingham recently. 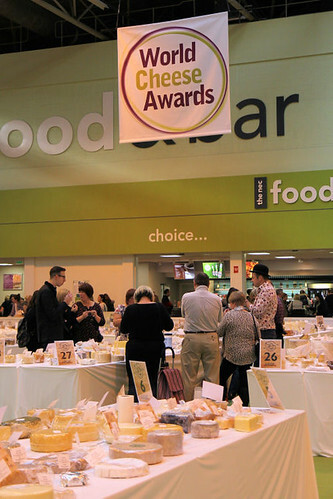 There was a buzz in the air (and a whiff of cheese!) 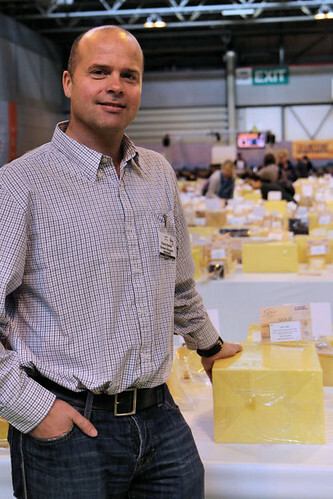 as the World Cheese Awards were being hosted there, with nearly 3,000 entries from 34 countries. 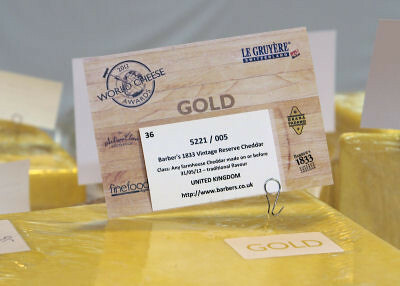 It was exciting to see that Barber's 1833 had won a gold award in the Farmhouse Cheddar category. 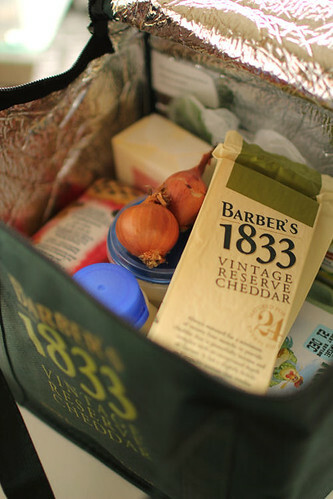 If you would like to try Barber's 1833, you can buy it from good supermarkets or from the online shop. Treat your cheeseboard to some Barber's 1833 for Christmas or New Year, you probably won't want to go back to any other Cheddar! It's also perfect for cooking, there's recipes and videos on the website too. As well as the Cheddar, Barber's also produce a range of regional British cheeses and butter under the Maryland Farm brand. 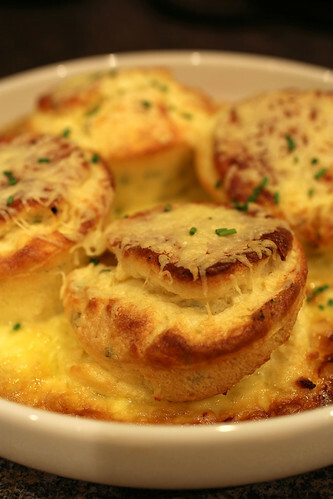 I was given the ingredients to make their twice baked Cheddar soufflés using Barber's 1833 Cheddar. 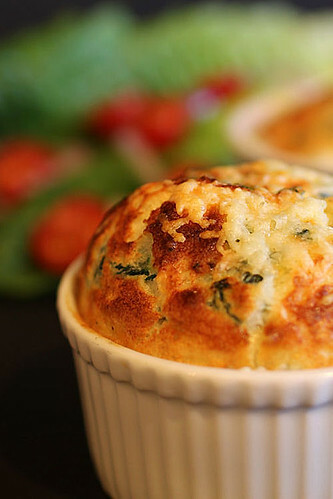 I can report that the soufflés were light and rich; the cheese gives the soufflés a fabulous deep flavour and they make a perfect starter or light lunch. Recipe taken with kind permission from the Barber's 1833 website. Preheat the oven to 180°C/Gas 4. Butter 6 individual pudding basins or ramekins. Place the milk, shallot, bay leaf and peppercorns in a saucepan and bring slowly to the boil. Strain into a jug. Melt the butter in a saucepan, add the flour and cook, stirring for 1-2 minutes. Remove from the heat and gradually stir in the milk. Simmer gently for 2-3 minutes. Add the cheese and stir until melted. Stir in the egg yolks, chives, salt and pepper. Remove from the heat. Whisk the egg whites until holding soft peaks then fold into the cheese mixture. Divide between the prepared ramekins. Stand the dishes in a roasting tin and pour in boiling water to come two thirds up the sides of the ramekins. Bake for 15-20 minutes until well risen and firm. Leave to cool. When ready to serve, preheat the oven to 200°C/Gas 6. 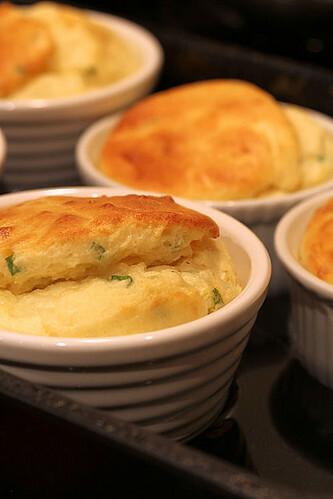 Run a knife round the sides of the ramekins and turn the soufflés out into an ovenproof dish. Pour over the cream, sprinkle with grated cheese and bake for 10-15 minutes until golden. Serve with salad leaves. Soufflés cooling before being baked with cream & more cheese! Disclosure: I attended the Good Food Show as a guest of Barber's and was given the ingredients to make the cheese soufflé recipe. 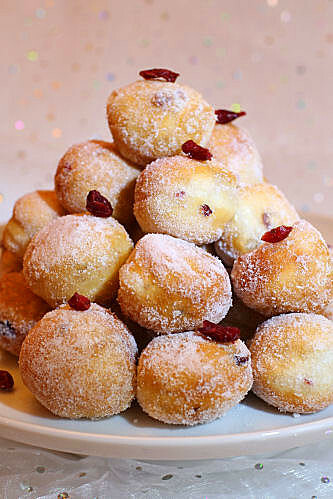 Doughnuts are so easy to make and the varieties are endless. 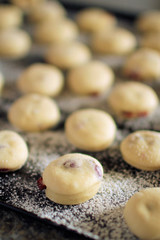 These little ones are studded with dried cranberries and rolled in sugar with a hint of cinnamon - little bite sized Christmas treats. The larger ones have a vanilla icing and are dusted with edible glitter. I made these in the bread machine using the raisin dough setting, but you can knead the dough by hand if you prefer. Makes about 35-40 mini doughnuts. Note: The liquid (egg and water) should weigh about 125ml together, so add the egg and top up with water to this amount. Put the yeast, flour, salt, caster sugar, butter, egg and water into the bread machine in the correct order for your machine. When it comes to the water, you may need a little more, keep an eye on it and add as necessary to make a smooth, soft dough. When the dough is ready, roll it out gently onto a floured surface, it should be 1-1½cm thick. Cut out little rounds with a small cutter, my cutter was 3½cm in diameter. Place them onto a floured baking sheet and lightly lay some cling film over the top, before leaving in a warm place to rise until they have doubled in size. Half fill a small, deep, heavy-based saucepan with sunflower oil and heat it to 190ºC. 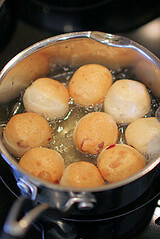 Carefully put 6-7 doughnuts (one at a time) into the oil and fry for about 2 minutes on each side, or until golden brown. Remove from the oil with a slotted spoon and drain on a plate covered with kitchen paper. Fry another batch, checking the oil temperature between each batch. Roll the doughnuts in the caster sugar and cinnamon, if using, until covered. These are best when eaten the same day, serve warm if possible. 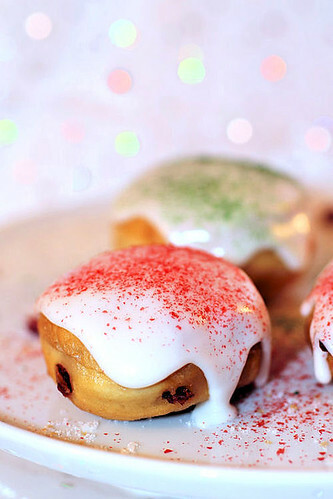 You can also make slightly bigger doughnuts, cover with a vanilla icing and decorate with edible glitter.